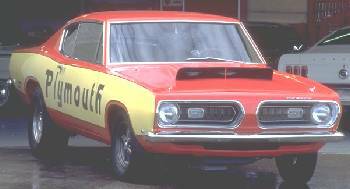 For many years, dropping the Hemi engine into the Barracuda was a popular way to gain dominance at the dragstrip. Chrysler, with the help of Hurst, sought to duplicate the efforts from the factory. 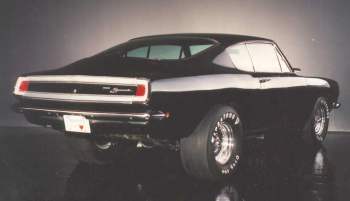 Chrysler would build the Barracudas and ship them to Hurst for the final conversion. The hood and fenders were fiberglass. The front bumper and doors were light-gauge steel. There was a Bostrom driver seat installed in the gutted interior. Getting the 426 Hemi into the engine bay took some modifications. The battery was moved to the truck. Both the right shock tower and master cylinder had to be moved. Custom headers, shift linkages for the four-speeds, and special rear-axle assemblies from Hurst. The cars came with street tires and a shallow oil pan off the trailer. Install slicks, a deeper oil pan, camshaft and valvetrain and you were into the 10s... easy. The S/S Hemi Barracudas were delivered in early May so they would be ready to qualify for the NHRA Spring Nationals. 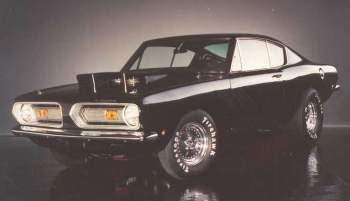 The Hemi-Powered Barracudas will be available through production in limited quantities in March. To order this vehicle, use the Barracuda Order Form and specify Body Code BO29 and Transmission Code, either 4 Speed Manual, Code 393, or Automatic, Code 395. No other specifications are necessary. 426 cu. In. 8-cylinder engine with dual 4-barrel carburetors-12.5 to 1 compression ratio. Chrysler-built 8 3/4" large stem pinion gear set, and heavy-duty axle shafts with automatic transmission (4.86 axle ratio). Dana-built 9 3/4" heavy-duty axle with manual transmission (4.88 axle ratio). 135 Amp. Hr. battery (located in rear compartment). Special heavy-duty 10 1/2" clutch and flywheel. All customer orders must be accompanied by a signed disclaimer (sample attached) indicating that the purchaser understands that this vehicle is sold without warranty and does not conform to Federal Vehicle Safety Standards. The modified intake manifold causes a rich surging condition, misfiring and unstable engine operation in cold weather, which makes ordinary street driving extremely difficult and it is not recommended for this use. Attached is a form letter (to be prepared on your letterhead) which should be thoroughly understood and signed by each prospective purchaser and attached to your order for each Hemi Barracuda Super Stock. The purpose of the letter is to explain the normal operation characteristics of these vehicles and clarify that the warranty coverage's do not apply. Be sure a letter in this form, signed by your customer, is included with your order so there will be no delay.